The holiday season in the Bay is a winter spectacular with the annual holiday celebration Festival of Trees through December 9th, 2016. Fairfield Bay’s Conference and Visitor Center is transformed into a wonderland of holiday elegancy and whimsy to suit any age, family or individual. 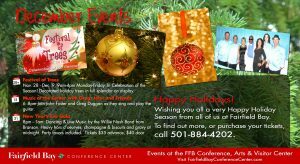 For more information go to: VisitFairfieldBay.com/festival, or call the Conference Center at 501-884-4202. Come and join John, Jeff and Greg along with other guest artists for a fun evening of great musical entertainment. Our Encore Lounge will be open with lots of special holiday drinks and along with Soup and Sandwiches for this festival event. Please remember that we have an extensive showing of local and regional art inside the conference center. Tickets are now on sale for our New Years Eve celebration. Tickets are $35.00 per person in advance and $40 at the door. Seating is limited so please get your ticket early. Call 502-884-4202 or come into the conference center. For Overnight Lodging and all information about activities at the center call: 501-884-4202. Our busy season is fast approaching. 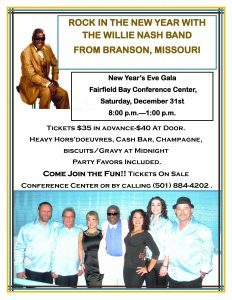 If you would like to lend a helping hand at the Fairfield Bay Conference Center, please see Trudy or Wilba. We need people for helping with events, office, set-up and more. Let us know what you are available to do and when. We know we can find a job for you AND we know you will enjoy working with our fun loving crew.